A cairn commemorates the 175th anniversary of Hume and Hovell`s journey of exploration. Near Beveridge is Mount Fraser (formerly Mount Bland), an eroded extinct volcanic cone. It is a large scoria volcano with two craters, which last erupted about one million years ago. The north side of the hill is quite steep and reaches a height of 125 metres above the surrounding basalt plain. From this location the explorers Hume and Hovell first saw Port Phillip on 14 December 1824. 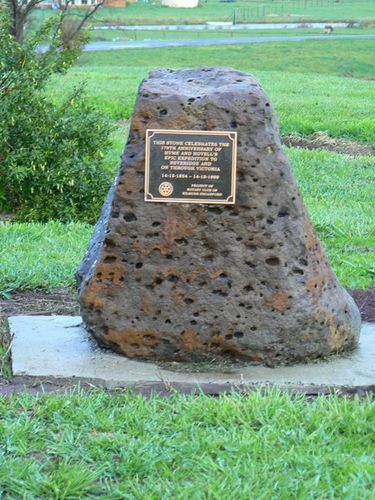 This stone celebrates the 175th anniversary of Hume and Hovell`s epic expedition to Beveridge and on through Victoria. 14 - 12 -1824 - 14 - 12 - 1999.